As per usual, Simon and Ross connect and engage even the most reluctant of readers to their bestselling “horrid” character, Horrid Henry. This time he is back with more despicable antics! Parents will only be relieved that their children are nothing like him. Christmas trees are ruined, the Nativity play goes to shambles, need I say more. random.org, and has won a copy of Horrid Henry and the Mummy’s Curse. More Horrid Henry? 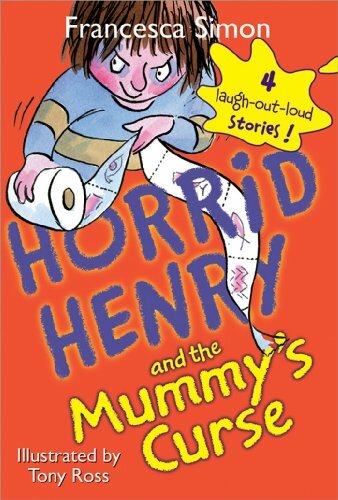 Yes, more twisted, laugh-out-loud Horrid Henry stories. Francesca Simon’s has perfectly executed her characters, again! Horrid Henry is a rotten, little devil. His persona represents the thoughts which go through most kids minds, at least occasionally. Perfect Peter’s character provides a blameless example of how different siblings can be and the rivalry that comes along with that. I also enjoy the subtle way that Francesca Simon’s involves the parents. She shows readers that Henry has absolutely no-idea of the effort that goes into being a parent. There are some truly priceless moments which are emphasized by Tony Ross’ wonderfully ghastly illustrations. Warning: These books contain first-rate silliness that may cause fits of laughter and have been known to split one’s sides. By Bianca Schulze, The Children's Book Review Published: April 10, 2009 Horrid Henry by Francesca Simon (Author) and Tony Ross (Illustrator) Reading level: Ages 7 - 10 Paperback: 112 pages Publisher: Sourcebooks Jabberwocky (April 1, 2009) What to expect: Behavior and brothers. Henry was horrid. Everyone said so, even his mother.